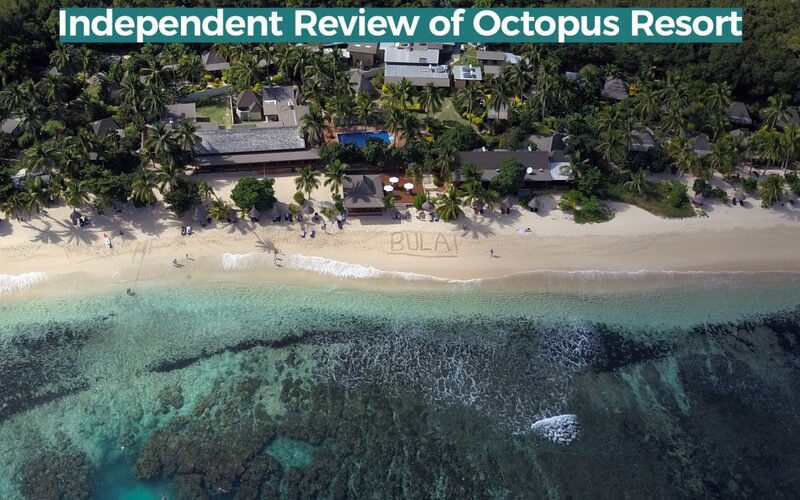 I just returned home from Fiji and wanted to share details about my recent stay at Octopus Resort in the Yasawa Islands. I stayed for a total of 7 nights in the seven-person dorm. I had an amazing trip and was very pleased with choosing this resort. I chose this resort for a few reasons: location, price, amenities. This review is independent and I was not paid or sponsored to write this. Getting to Waya Island is surprisingly easy. There are a couple ways to get to the island, but they can be a bit expensive. I opted for the resort boat as it was relatively quick and meant I could enjoy more time on the island. Both are about the same price ($160-$170 USD return trip) and both included a free shuttle to/from the marina. I was picked up from my hotel on Denarau Island and taken by shuttle to Vuda Marina (about 40 mins away) where I rendezvoused with the resort boat. A little over an hour later, I shuffled onto a smaller boat and was swiftly taken to shore (there is no jetty due to reefs). I was greeted with a song ‘Bula Maleya’ from the resort staff and directed to the dining area to have a seat. 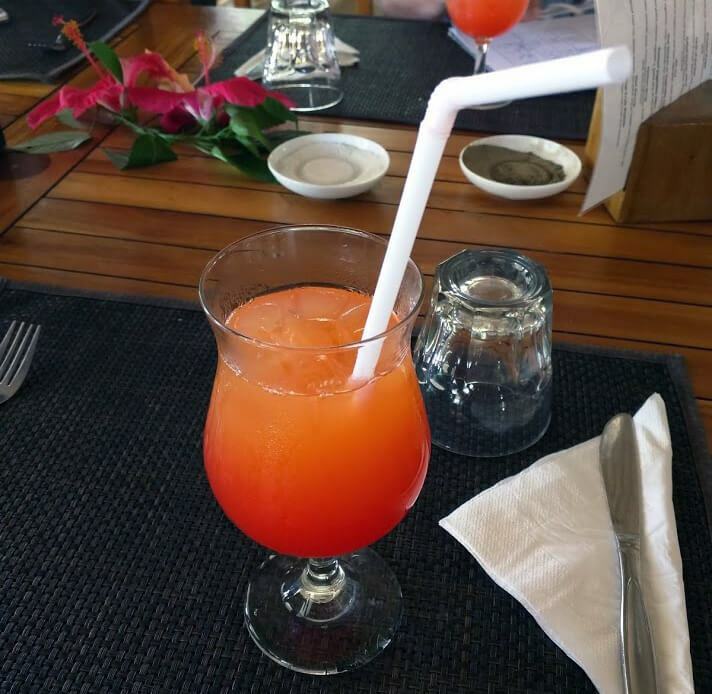 My bags were unloaded and brought to the arrival area as well while I enjoyed a delicious (non-alcoholic) Mai Tai. Shortly after, the resort manager, Amanda, greeted us and we started the check-in process. As I was staying in the dorm, I was assigned a bed number and then guided to the dorms along with my bags. Think of the Yasawa Flyer as the scenic route. It’s the slowest option (around 3 hours), but majestically flies by multiple islands before stopping at Waya. It departs from Denarau Marina. The resort boat is the quickest option, around 1 hour, 15 mins. It departs from Vuda Marina and goes directly to the resort, passing between a couple islands. The dorms were quite nice and even had air conditioning! The beds aren’t numbered or assigned, so you can choose any bed that is free. 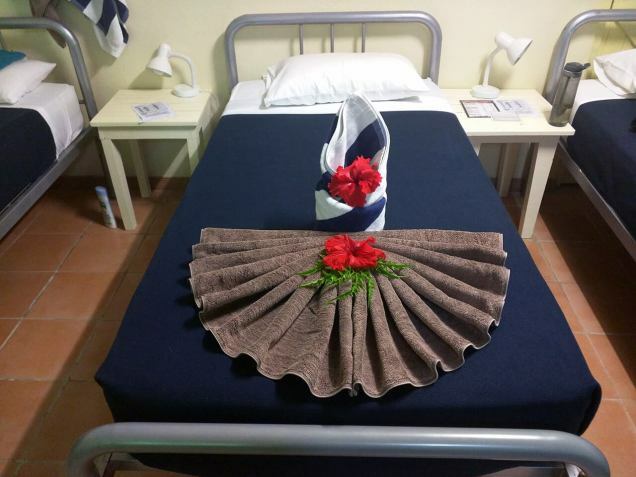 Each bed had it’s own night stand, lamp, and power outlet, along with a bath towel and a beach towel. Linens were provided as well. Under each bed was a large lockable chest. I brought my own lock, but I’m not sure if locks were available to rent (they weren’t mentioned). The beds were quite comfortable, though my favorite thing would be the air conditioning. Next to my dorm was another 7-person dorm, then a bathroom with multiple toilets, showers, and sinks (each in their own private stall). The showers had soap provided as well. During my stay, I noticed the power went out a couple times (only for around 15 minutes each time), though that’s kind of expected when you’re on a small island in the middle of the South Pacific. I also noticed that although the resort descriptions say a mosquito net is included, I did not see one. Bug spray was provided though, and I did on occasion see resort staff spraying the grounds for mosquitos. Octopus Resort has beautiful lush tropical plants, a stunning white sandy beach, and a nice, deep (2.8 meter ~9 ft) swimming pool. It sits facing west, so every night there was a spectacular sunset over the ocean. Right off the beach is a colorful tropical reef that peeks above the surface at low tide. It was fulled with fish and was pretty top notch. I’d say it was some of the best coral I’ve seen. A short distance away was a small Diving Shack where you could rent a snorkel, kayak, or other beach toys, and also sign up for all organized trips/tours from the resort. I brought my own snorkel on this trip so I didn’t rent anything. There was also a bar right by the beach (Coconut Bar) that served cocktails and beers. As you’re required to purchase a meal package for each person staying at the resort (or hostel), all food is included. Breakfast, lunch, and dinner were all located in the same part of the resort. 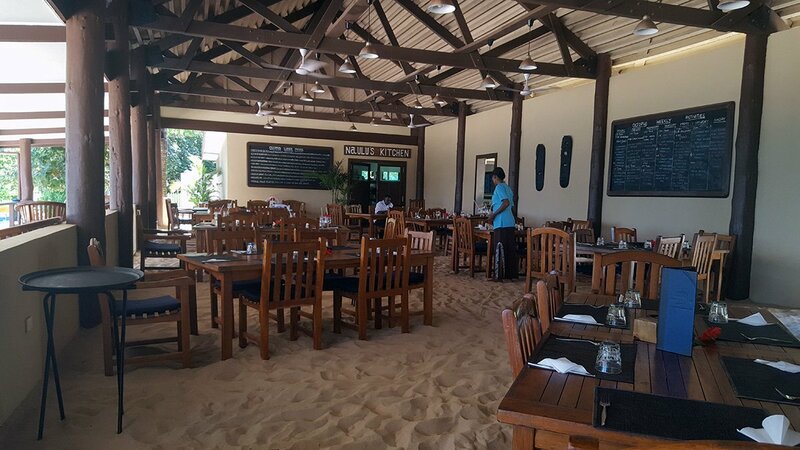 The dining area was pretty nice with a sandy floor–no shoes required. There were a few tables you could reserve, but most were 6-person tables that were shared with other guests. It was pretty nice being able to interact with everyone and meet new people. As for the food, let’s just say it was delicious. Breakfast was a buffet style with quite a few choices–toast, pancakes, fresh fruit, baked beans, sausage, yogurt, muffins. There was even coffee, tea, and several fresh juices available. For lunch, there was a pretty sizable menu to choose from. I was on a mission to try something new every day so I just went down the menu and tried each thing. 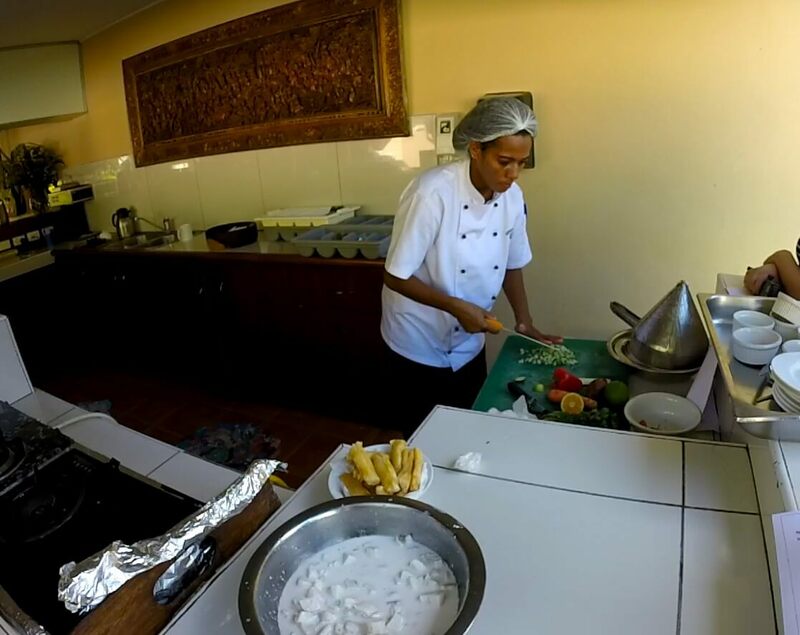 The offerings included things like: a chicken wrap, burger with fries, stir fry, fish, and always a local Fijian dish. Dinner time was entirely different. Each night there was either a set menu (with a few choices for appetizer, entree, and dessert), or more of a buffet style where they bring a wide variety of food on plates/bowls to the table and you pick whatever you like. I participated in a couple activities while I was here. Everyone knows (or should know) that you have to try Kava if you visit Fiji, so I went to a Kava Ceremony with the locals. It was great being involved in their culture and learning more about the locals. A friend I met at the resort invited me to take a cooking class with her. I was pretty interested so I figured why not! We learned how to make a traditional Fijian dish called Kokoda (pronounced Koko-nda). It’s very similar to Ceviche. Basically, it’s a raw Walu fish that is ‘cooked’ by marinading the fish in lemon or lime juice. The fish is mixed with freshly made coconut milk (we literally shredded the coconut and made the milk). Additional ingredients were added – Carrots, Bell Peppers, Onions, Cilantro, Salt, Pepper, then it was served in a bowl with fresh Cassava Fries. The class cost around $15 FJD and included eating the meal. Feeding the fish was one of the free activities that was quite a bit of fun. At the designated time, we met at the dive shack then swam out to the buoy near the reef. Shortly after, our guide pulled out a piece of meat in the water and fish swarmed us nearly instantly. It was surreal seeing all the fish from every direction coming up so close and personal. I was also invited by another friend I had met to go fishing on the reef. It was sort of last minute, but it was also a lot of fun. Together, we ended up catching 5 Bonita Fish! 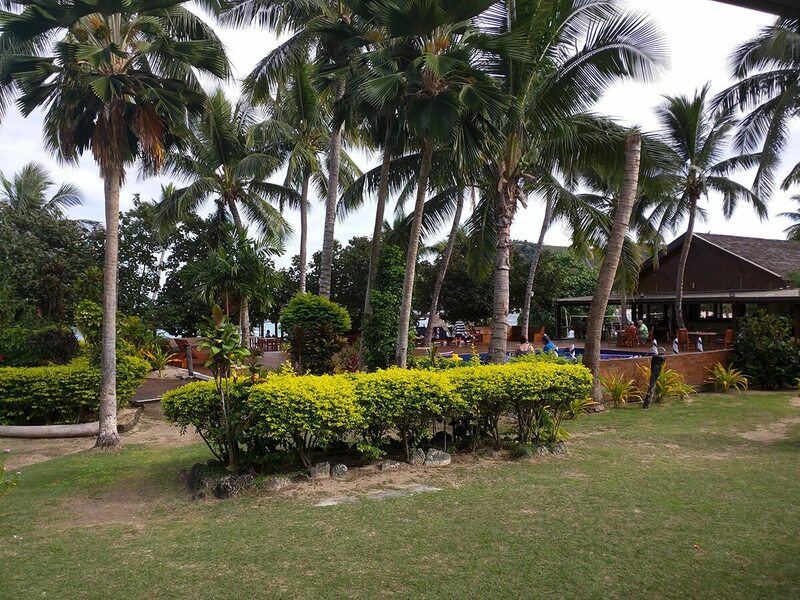 I had a great time visiting Waya Island and staying at Octopus Resort. I would happily return here in the future.